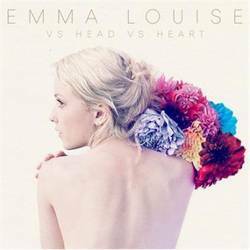 Emma Louise described the cover art for her debut album Vs Head Vs Heart as expressing "the beauty that can come out of vulnerability". The cover art fittingly reflects the songs on Vs Head Vs Heart, vulnerability is seeping through every song in a flurry of initially guarded lyrics, before being torn down note by note to reveal the real emotions at the centre of this album. The Brisbane-based singer-songwriter originally began busking at local markets, before eventually saving up enough money to record her debut EP Full Hearts and Empty Rooms. The EP is a folksy, acoustic record, whereas Vs Head Vs Heart is a full-on electronic affair. Opener "17 Hours" has a pure, choral sound, channeling naive innocence with each layered vocal and silent synth, effectively setting the album up as song-by-song the layers are stripped away eventually revealing fragility, desire and desperation. "Atlas Eyes" shows Emma Louise's voice being guided by syncopated drum beats while "Braces" sounds like an epiphany in the midst of confusion, before nose diving straight back into the tension. The bolshy, anthemic "Jungle", which was first featured on the Full Hearts and Empty Rooms EP and has garnered regular airplay in her native Australia, makes for a unique stop gap between the warring emotions in the other tracks on the album. Some of the lyrics are sung as though they are coming in a stream of consciousness, frazzled and rushed but with an urgency that ultimately gives "Jungle" its appealing edge. The recurrent themes throughout the album are of contradiction and tension, until the final track "To Keep Me Warm" lays everything bare and finally Emma Louise's guard is down in a subtle mix of hushed vocals and minimalist instrumentation. But there's a dichotomy here; some of the songs sound like how someone initially wants to be viewed, the glowing synth-pop of "Boy" and the charged excitement of "Freedom", almost convincing themselves of what may be a contrived reality, before these notions come crashing down in a barrage of achingly honest songs, like peeling back the bark of a tree. "To Keep Me Warm" shows Emma Louise at her most vulnerable. Her vocals are enveloped in twinkling understated synths, as she admits "The night is cold/I don't like to sleep alone", before building to a chorus which ultimately exposes a frank admission of desperation and desire, "I want to sleep with him/To keep me warm". Once the stark honesty of the chorus is reached it almost robs the music of all power and importance, here the vocals and lyrics are key. Vs Head Vs Heart is a strong debut, and has the sound of an album that captures moments of weakness and makes them sound beautiful. Even at its most contemplative and low this album is a compulsive listen. Sometimes vulnerability can be a very good thing. Posted May 27, 2013, 10:48 p.m.
Posted Feb. 2, 2014, 3:05 p.m.